Setia Sky 88 is a new condo complex of 3 towers each with 55 floors in the central Johor Bahru. Given the huge supply and much lower demand for luxury rentals in Johor Bahru it is a renters market. 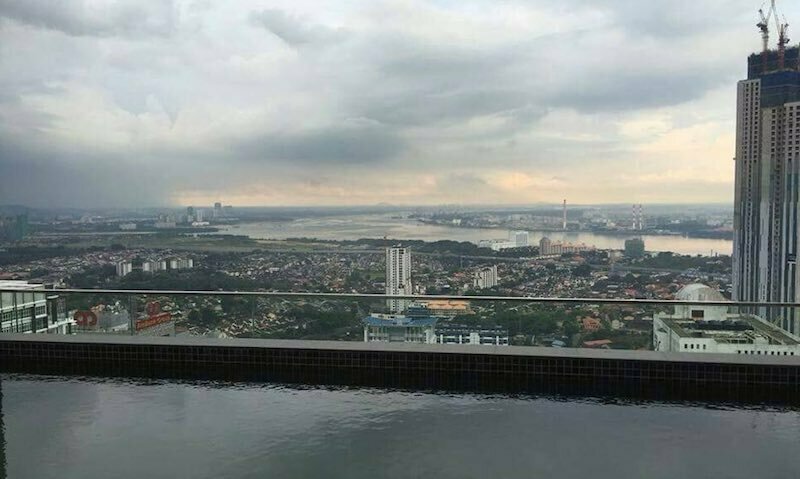 View from Setia Sky 88 pool deck, looking toward Singapore. Rents range from 2,000 MYR/month to 3,000 MYR/month (for 800 to 1,200 square feet). Purchase prices range from 600,000 to 900,000 MYR. MYR 2,800/month – 2 bedrooms, 2 bathrooms, 1,012 square feet, fully furnished. MYR 1,800/month – 2 bedrooms, 2 bathrooms, 1,119 square feet, fully furnished. MYR 2,400/month – 1 + 1 bedrooms, 2 bathrooms, 872 square feet, fully furnished. MYR 1,900/month – 2 bedrooms, 1 bathroom, 750 square feet, fully furnished. The Setia Sky 88 complex includes: children’s theatre room, soft play area, childcare centre, infinity pool, gymnasium, manicured landscape garden, spa zone, sky pool, sunset deck and karaoke room. Learn more about Setia Sky 88 on our information page. Here is a webcast showing a 360 degree view of downtown Johor Bahru in 2014. You can see the sky scrapers in the central business district (CBD) of Johor Bahru and Iskandar and in 5 years this will show many more high rise luxury condos. The beginnings of numerous (more than the total completed high rises) are visible in the video. The CIQ, the causeway to Singapore, the Straits and Singapore beyond are visible. Even Singapore’s Marina Bay Sands, located at the far southern edge of Singapore, can be seen in the background. Since my last post on the construction on Setia Sky 88 things have picked up quite a bit of speed. After not going above ground level in a year, they have over 6 levels built. Close up of construction; it seems like they may have completed the car park levels and are starting on other levels? 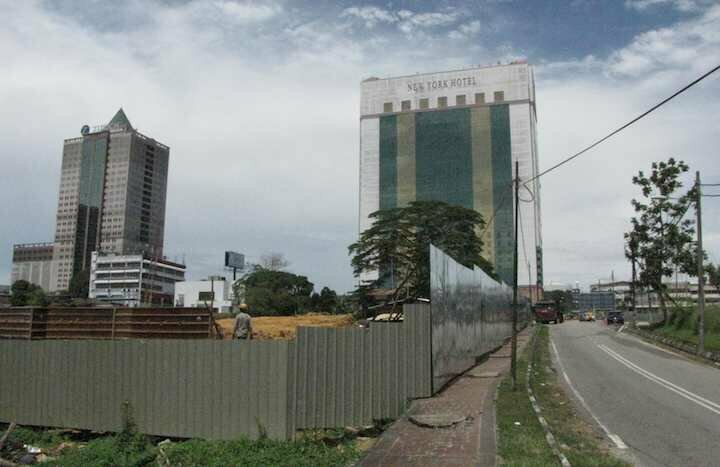 Setia Sky 88 and Twin Galaxy are located right next to each other near KSL Mall and Plaza Pelangi in Johor Bahru CBD. Here are a few photos of the progress so far. 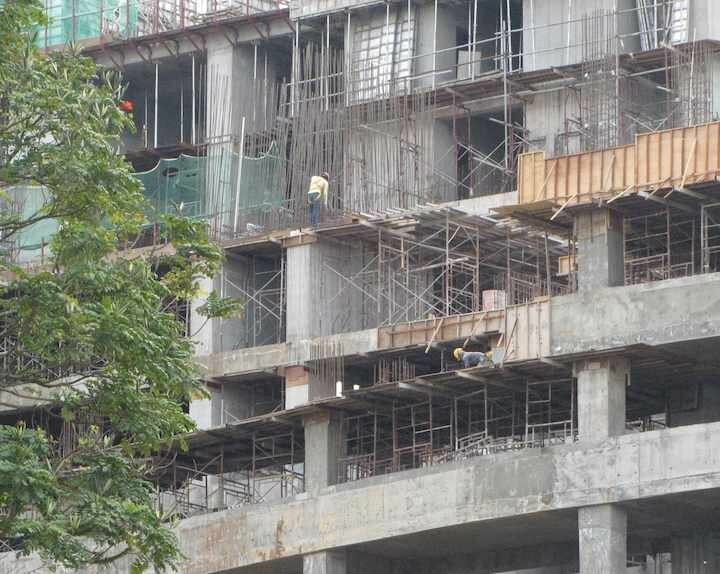 The Setia Sky 88 site had nothing going on for months but lately has had some activity. KSL mall and resort is partially visible on the upper left, Plaza Pelangi is just off the screen on the right. 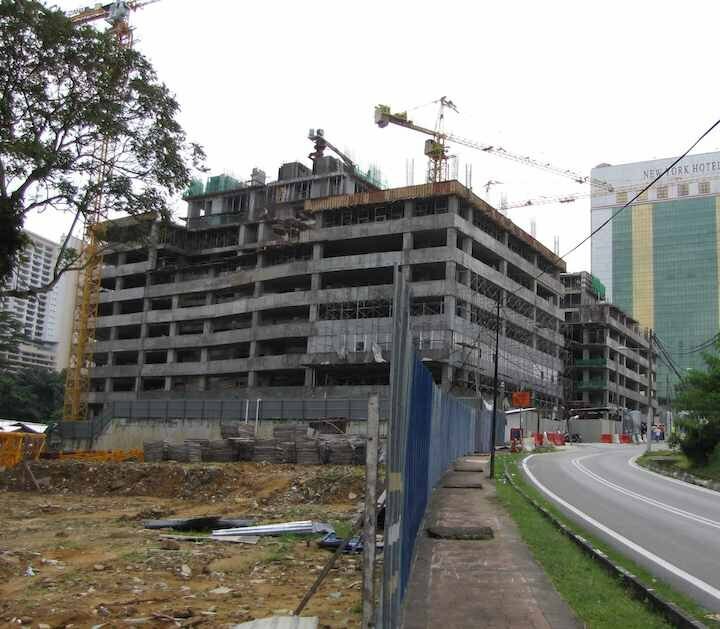 See our post from February 2013 on the Construction Progress for Setia Sky 88 and Twin Galaxy, one year ago. Twin Galaxy has been making quick progress. Twin Galaxy has been nearly continuously busy and is rising quickly. 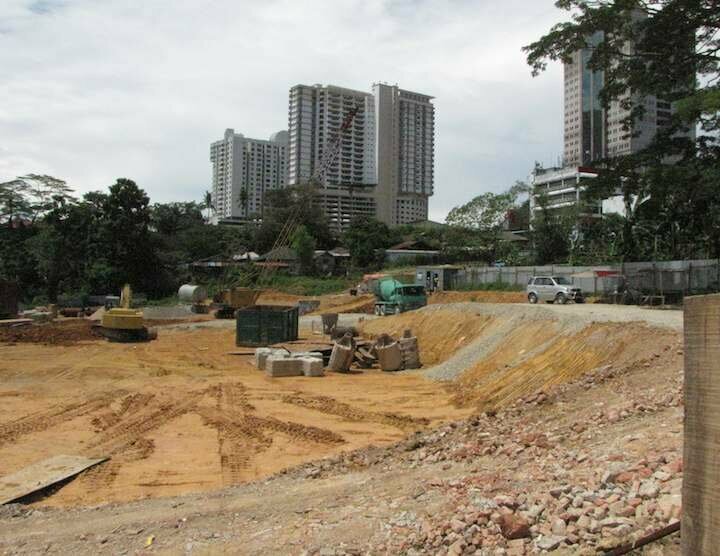 Setia Sky construction begins as they prepare the site. I took these photos over 3 months ago but it looks pretty much the same today. They have seemed busy the whole time with people working and trucks going in and out. My guess is they are digging out to work on the foundation and that really doesn’t give you much to look at as a casual observer. 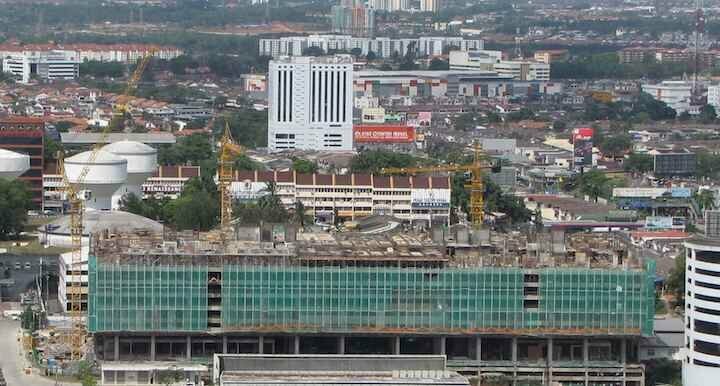 Setia Sky site (on the left behind the walls) with New York Hotel in background. 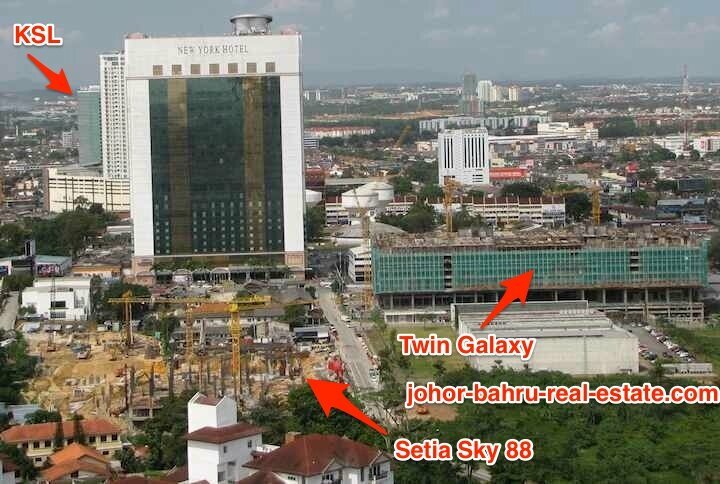 Twin Galaxy will be on the right of this photo (closer to the road with the New York Hotel than Setia Sky 88 is).